If more than a million people go to your father’s funeral, and you’ve chosen the same line of work, you’ve got a lot to live up to. No one alive can make politics and poverty groove like Femi Kuti with his band, Positive Force. The son of the late Afropop founder Fela Kuti brought his father’s legacy of hard driving, super high-energy, perpetual groove to the Beachland Ballroom Thursday night. With a tight five-piece horn section punching out rhythm like mountain peaks blasting through an earthquake . . . what can a white man say? Femi Kuti will always walk in the shadow of his father. Indeed, that’s how he has cast himself. He plays sax and keys, just like the late Fela did. He’s built the same kind of band, heavy with percussion and horns, but electrified, too, with bass, guitar, and more keys. His vocals are backed by a chorus of women who sing and shake themselves prodigiously. And again, just like his father, he sings about pan African politics: Africa for Africa is the title of his new album. “Borders arise to keep us forever separated,” he sings. If he weren’t so good, you’d say he’s riding his father’s coattails. And of course to some degree he is. That’s what you do when you carry on a family tradition. But Femi Kuti has taken up the mantle and wears it well. He sings his own songs, none of his fathers. His lyrics lean a little more on platitudes and generalities compared to the journalistic quality in his father’s real life stories of physical violence, and charges of political and corporate corruption. And of course Femi Kuti is not running for President of Nigeria . . . at least, not yet. But Femi’s sound is evolved into something distinctive from his father’s. He’s worked with some other performers, like Mos Def, adding a taste of hip hop, like in this tune (which of course—given that Mos Def was not in the house—was not on the playlist Thursday night). Young Femi also gives his chorus more melodic material, and more meaning to carry. They lend their rhythmic punch just like they did behind Fela’s band, but the son gives the girls a little more of a voice. 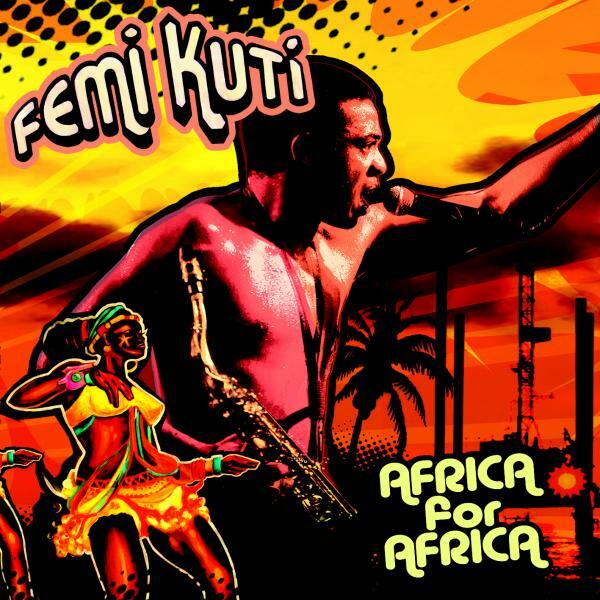 Femi has one thing over Fela: He’s alive and singing up a revolution now. And just like dad, he is powerfully good at making dance music out of ineffectual government and the struggle of impoverished people. There wasn’t any shortage of that Thursday night. FEMI KUTI COMES TO BEACHLAND; ROCK HALL ASKS, CAN MUSIC BE CLEVELAND’S WEAPON? While he was running for president, Nigerian Afro pop founder and heavyweight champion Fela Kuti declared the neighborhood around his Lagos nightclub to be independent of the rest of Nigeria. He called his neighborhood the Kalakuta Republic. The familiar-in-Cleveland phrase “arts district” is way out of its league, here, but bear with me if you can stand it. The tiny nation was anchored both spiritually and economically by Kuti’s nightclub, The Shrine, the de facto religious shrine where Kuti performed each night. According to the documentary Music Is The Weapon, The band would start playing late at night, break for sacred ritual at one or two in the morning, and then continue the party until dawn. Every aspect of Fela Kuti’s life, it seems, was extreme. He was charismatic like Elvis. He founded a political party (Movement Of the People) in response to government corruption and a general failure to lead in Nigeria. The government responded to his political ambition by sending 1000 solders to raid the Shrine. They brutally beat people, including women and children. They threw his mother –a political figure in her own right–out a second story window. Days later she would die of injuries. Afterward Kuti took 27 women under his care by marrying them all in a single ceremony. They were his “queens” –the singers of his choir who gave his music a mighty rhythmic punch. The music of the Kalakuta republic and its nightclub shrine employed hundreds of Nigerians. When Fela Kuti died of AIDS in 1997, more than a million people attended his funeral. 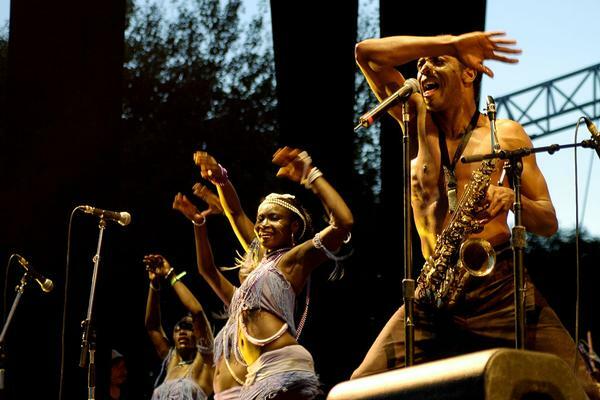 North Collinwood is going to feel a little like the Kalakuta Republic this week as Femi Kuti, son of Fela, brings his band Positive Force to the Beachland Ballroom. His sound is a little more western than his father’s, a little more hip hop, and – he has said—a little more jazz. And if you haven’t seen the video Music is the Weapon (Stephane Tchall-Godjieff and Jean Jacques Flori’s landmark documentary about Fela Kuti) check that out, too. I’ll wager that more than one Cleveland music fan has already referred to the Beachland as a shrine. The former social is a mainstay not only on Cleveland’s music scene, but also for the economy of the Waterloo neighborhood. It’s the main attraction, bringing people and new investment into the neighborhood. Indeed, up and down Waterloo, new shops have popped up, drawn by the neighborhood’s independent musical vibe, and adding to it. Even the Northeast Shores CDC is trying to leverage the attraction, by marketing the neighborhood’s low-cost houses to musicians. Meanwhile, Beachland co-owner Cindy Barber will explore the question of whether rock and roll can revive neighborhoods the following week as part of a panel discussion hosted by the Rock and Roll Hall of Fame and Changing Gears, the public radio collaboration between NPR stations in rustbelt cities struggling to re-invent themselves. 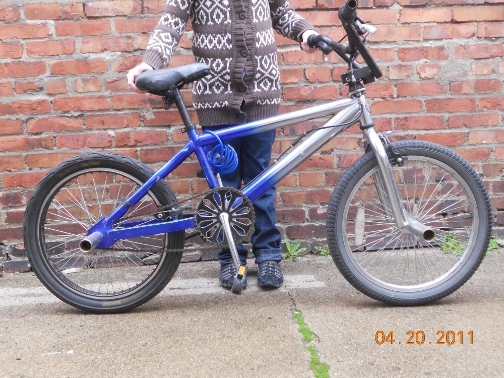 My girl with her bicycle. Photo by Michael Gill. It’s Earth Day. It’s my daughter’s birthday. And not entirely by coincidence, it’s Launch Day for this blog. Gyroscope-that-takes-you-places is about culture, neighborhoods, and making the world a better place. It’s about people, especially artists and performers in Cleveland. It’s about places, especially old neighborhoods. And it’s about things: most of the things are made in the old neighborhoods. Most of the things that are not made in those neighborhoods are bicycles. The bicycle is the miraculous invention that brings all that together. It’s art. It’s technology. It’s transportation on a neighborhood scale. It’s beautiful, clean, green, and convenient. It’s fun. Even a kid can ride one. A bicycle is a gyroscope that takes you places. Watch this space for news and musings about Northeast Ohio art, artists, and arts districts. About neighborhoods, gardens, and bicycles. About things people are doing to make the world—especially Northeast Ohio—a better, greener, more beautiful place. Happy birthday to my daughter. Happy Earth Day to you. Sunny days are coming. Get on your bikes and ride.